Birthday cakes can be whatever you would like. 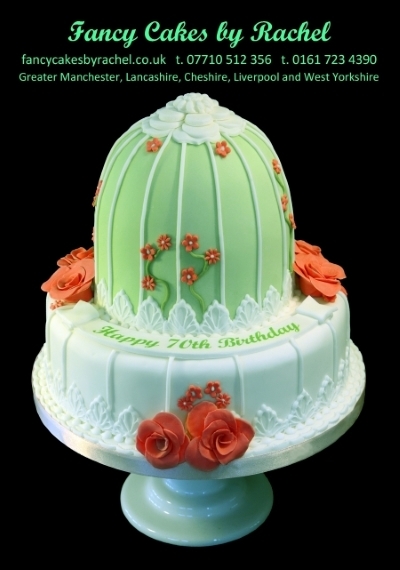 Look at our photo gallery to see the range of cakes our clients have requested. Our Chocolate box cake is a firm favourite. A round or square cake is decorated to look like a beautiful box with a layer of chocolates of your choice on the top. The "box" lid is open so you can see the delicious chocolates inside. Decorated with bows and flowers and in your choice of colour, every chocolate box is different. Cakes with bouquets of hand made sugar flowers are always popular. Look at our gallery to see the flowers we make. Character cakes can be based on a hobby or pastime, a favourite football team or to reflect a special holiday or event. All of our cakes are baked fresh to order using the best quality ingredients. You can choose from a range of different flavours, please look at the cake flavours page. The most popular flavours for birthday cakes are the vanilla madeira cake with jam and buttercream filling and the rich chocolate cake, made with real chocolate. If you have a photograph you would like on your cake send us the picture and we can incorporate it into the design - See photo cake page for more details.